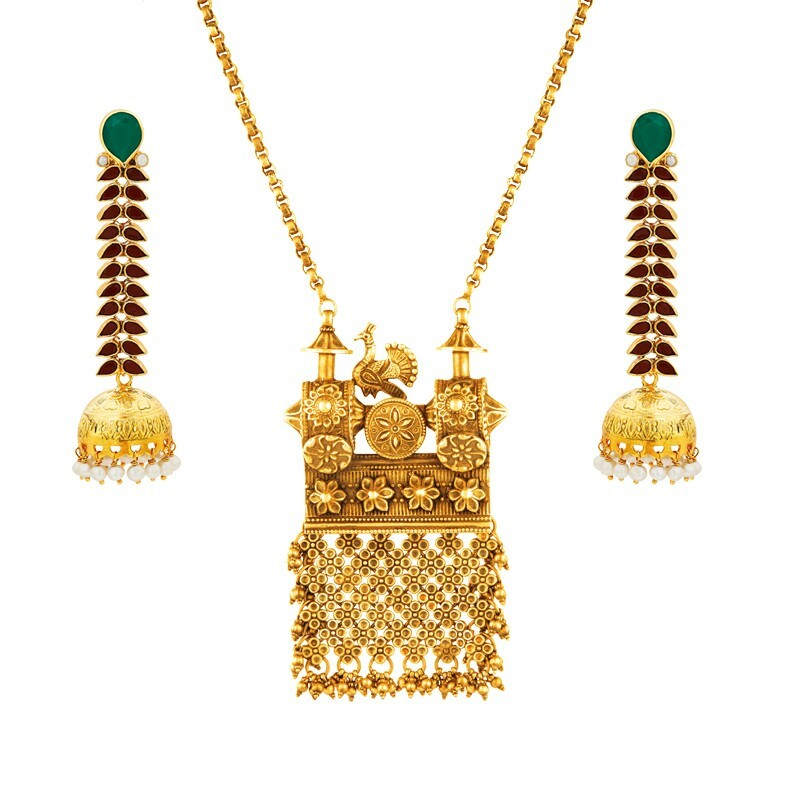 PEACOCK CHARIOT FLORAL MESH GOLD PLATED NECKLACE - A period piece designed as a flexible mesh of gold plated silver links shaped as stylised flower heads, suspending a fringe of gold plated silver bead terminals surmounted by a delightful three dimensional peacock setting on a chariot of two wheels and a base of four floral motifs. Mounted in 92.5 Sterling Silver and plated with 24 Karat Gold. RED GEMSTONE VINE JHUMKI - A long earring consisting of a vine or leaf motif rendered in red stones surmounted by a pear shaped green onyx suspending a gold plated carved jhumki fringed with seed pearls. Ahilya has one of the largest, finest and most exclusive collection of Silver Jhumkis. Mounted in 92.5 Sterling Silver and plated with 24 Karat Gold.